Have you wanted to come to La Villa Bonita but couldn’t quite find it in your budget? Your ship has come in. Now is your time. Pack your bags. Join us this summer! An offer like this will not be repeated. Respected travel experts like Peter Greenberg are telling travelers that now is the time to travel to Mexico as hotels have a lot of space and are offering big discounts. As well, the timid and uninformed traveler will stay at home making you an even more desired and honored guest! You will be appreciated! La Villa Bonita is no exception. 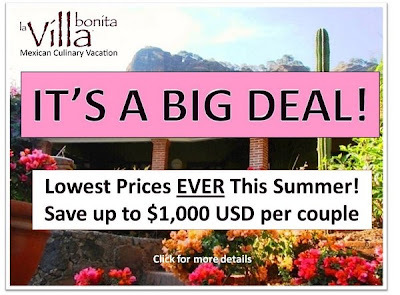 Summer is a great time to join us at La Villa Bonita. Why? Because it is one of the most temperate seasons of the year. Crazy isn’t it? Everyone thinks Mexico has to be hot during the summer. April and the beginning of May are our hottest months of the year in this part of central Mexico. Then cooling rains begin at night in mid-May to make the temperature very enjoyable. The rains start at about 10 at night making for wonderful sleeping weather and the sun comes out during the day keeping it cool but not humid. As the summer progresses, the gardens and mountains become vibrant green with numerous waterfalls emanating from springs in the surrounding mountains. As well, we have plenty of room for other dates this summer in June, July and August. If you cannot join us for the big sale this summer, you can still get a great discount but you need to make your reservation for post-August dates by May 28, 2009. You will receive a 20% discount but you have to act fast (click on the picture for full details). As usual, the informed person always gets the best deal! just want you to know i have been trying all day and there is a problem with your website for the villa..it will not load at all…wanted to show it to my other half because we may want to come this summer! We checked our links and they all appeared to be working fine. Our website is http://www.lavillabonita.com if you want to go directly there or give us a call at 1-866-687-9933 US toll free or 646 216 8604 US and we would be happy to assist.